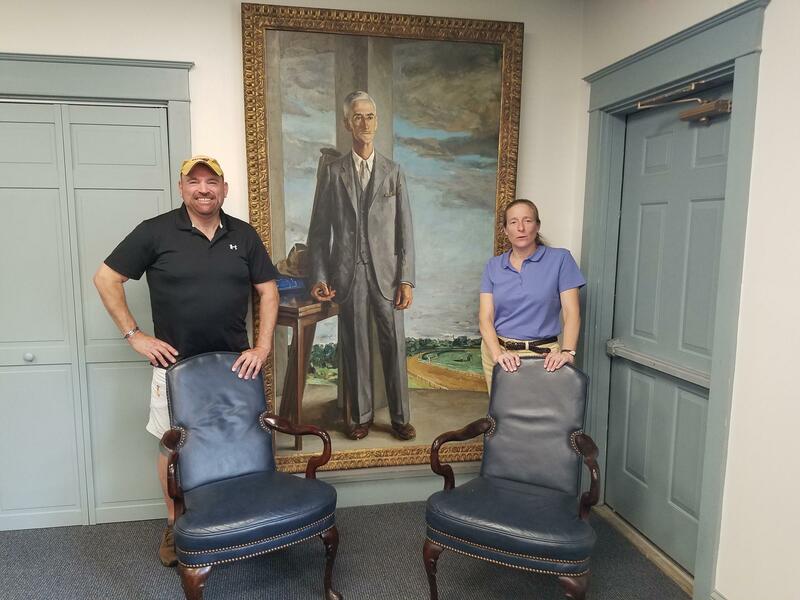 Ross Peddicord and Carla Geiersbach pose with a portrait of William DuPont Jr., who once owned the property known as Fair Hill. Fair Hill, on a 5,600 acre state owned site, includes a nationally prominent horse training center, a race track with grandstands, a cross country course with wooded trails open to most all comers and equine therapy center for horses recovering from injuries. Bruce Jackson, who runs the therapy center, says he’s rooting hard for Fair Hill to win the honor. "I think it will be excellent," he said, "a great addition to the community and I think everything else it encompasses will be terrific for the area." But even if Fair Hill’s "four star" bid loses out, plans are already underway for what may be an $8 million upgrade to the property. The make-over designed by organizations based at Fair Hill, including the Cecil County Fair, calls for rebuilding aging grandstands, irrigating a turf course so it doesn’t become hard on the hooves after only one day and digging pedestrian tunnels under Telegraph Road, which runs through the horse enclave. Unlike commercial horse racing, which draws much of its income from gambling, Fair Hill relies largely on private contributions boosted with some state and local government help. Ross Peddicord, executive director of the Maryland Horse Industry Board, said a deal has been struck with the state to finance Fair Hill upgrades with a 50-50 public-private split. Some of the money has already come in, but raising the rest remains a challenge. "Of course, there’s no gambling involved, so we have to be more creative in finding ways to finance these projects," he said. 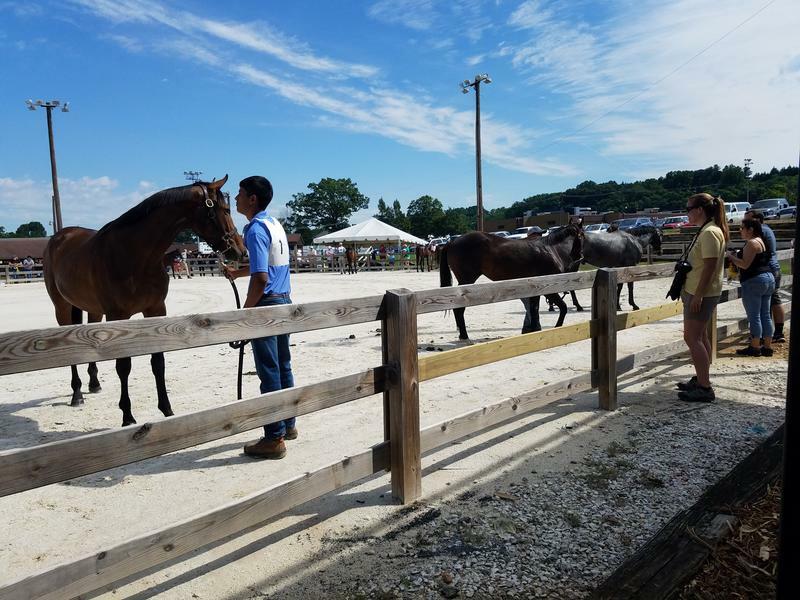 Carla Geiersbach, executive director of Fair Hill International, a non-profit that has been hosting Olympic level horse contests there for 30 years, said the whole horsy community is helping with the project. "We are all working together to come up with improvements that will work for all the disciplines, which is why it’s been so much fun," she said. "That will be happening whether we get the four-star or not." If Fair Hill beats out its Virginia competitor for the event, it would become one of only two facilities in the nation to share that honor—the other one is in Kentucky--and one of only seven world-wide. The distinction would seem a fitting tribute to William Du Pont, Jr., the well-heeled horseman known as Willy, whose estate was purchased by the state in 1974 and dedicated to the preservation of property for equestrian traditions. Peddicord says that’s a lot of such traditions. "We have 35 different equestrian disciplines in Maryland. From polo to dressage to three-day eventing, to show-jumping, to fox-hunting, to steeple chasing to western riding and rodeos. It runs the whole gamut here."